"If thou doest well, thou shalt be accepted"
"If thou doest not well, sin lieth at the door"
Today we will study the lives of two contrasting people, Cain and Enoch. Enoch does well and is accepted. Cain does not do well and is ultimately rejected. "ceased not": What a great example from our first parents. Also when you consider their holiness and dedication to the gospel, and then consider how at least one of their sons turned out, maybe we should not be so quick to condemn parents whose children are wayward. "You parents of the wilful and the wayward: Don't give them up. Don't cast them off. They are not utterly lost. The shepherd will find his sheep. They were his before they were yours--long before he entrusted them to your care; and you cannot begin to love them as he loves them. They have but strayed in ignorance from the Path of Right, and God is merciful to ignorance. Only the fulness of knowledge brings the fulness of accountability. Our Heavenly Father is far more merciful, infinitely more charitable, than even the best of his servants, and the Everlasting gospel is mightier in power to save than our narrow finite minds can comprehend." "Abel was a keeper of sheep, but Cain was a tiller of the ground": not to disparage the many noble farmers out there but there seems to be a little symbolism here with Abel representing The Good Shepherd and Cain representing the Disturber of the Earth - Satan. Can you see other areas where this symbolism and parallelism is apparent? "And Cain loved Satan more than God": what does that even mean? This is not your usual flawed, just-find-it-tough-to-keep-the-commandments kind of person. This is not even a person who just doesn't care. He actually loved Satan, and more than God. What attracted him to Satan? Satan commanded Cain to make an offering unto the Lord: what? why? what's going on here? what is Satan's motive here in getting Cain to make offerings to the Lord? Can we learn anything useful from this strange commandment that can help us today? Cain's offering was not acceptable to the Lord: why not? cf Moses 5:5-7 Does this help us understand why Cain's offering was rejected. What does this tell us about the sacrifices and offerings we make today? "Now Satan knew this and it pleased him": was this all part of Satan's plan? How did he know Cain's offering would not be acceptable? "if thou doest well, thou shalt be accepted": simple lesson, what do we need to do to be accepted of the Lord? "if thou doest not well, sin lieth at the door": is "not doing well" the real problem? No. The real problem is that not doing well takes you closer to the edge (door) where sin is. But even then we can be saved if we "hearken unto (his) commandments". Watch this video of David Bednar explaining the same principle. Notice the Lord says "except thou shalt hearken unto my commandments...it shall be unto according to his desire": Who's desire? cf 2 Nephi 2:26 the Atonement frees us from Satan's grasp so that we can act for ourselves and not be acted upon. What a waste of the Atonement if we then willingly return to a state where we can no longer act for ourselves again but are instead acted upon. "I have found that Satan frees men to bind men: God binds men to free men". "it shall be unto thee according to his desire", "And thou shalt rule over him": one is a mortal consequence and the other is an eternal consequence. what do we learn about Cain's personality and character in these verses? Very similar to Satan. I wonder why he did not choose to follow Satan in the premortal sphere. In a way he was smarter than Satan because at least he waited until he had a body before he rebelled! But they both seemed beset by the same pride, arrogance and greed and illusions of grandeur. I mean he called himself the Master Mind or The Great One. cf v.31 "that I may get gain", v.33"surely the flocks of my brother falleth into my hands" Did you notice the same pattern Satan followed in thinking that if he killed Christ, that he would gain control over the souls of all men. up to now it appears that the serpent/Satan has been cursed and the earth was cursed for Adams sake but Cain becomes the first person that we know of to be cursed. Why? "he that findeth me will slay me": is this is the very first time anyone on earth experienced death? If not, it was certainly the first time anyone on earth had experienced murder in their midst, and of a loved one. I imagine it was the same shock we experienced on 9/11 multiplied 100 times over. To suddenly see it in their midst for the very first time must have been incredibly shocking. You can understand therefore Cain's belated worry about his brothers and sisters reactions to his actions. I note also a tendency from Cain for self-pity. His first reaction we read of could possibly be interpreted as a complaint that he doesn't think he sees enough of the Lord. He wants more attention and he doesn't care where he gets it from as we see when we learn he loves Satan more than God. But he still gets angry when the Lord does not accept his offering. 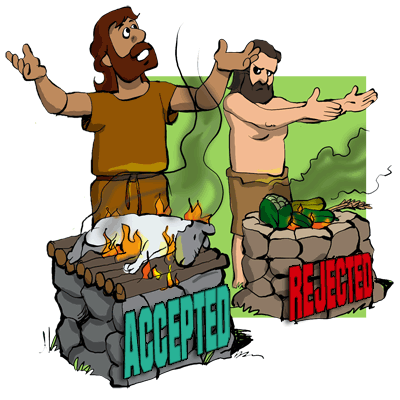 I wonder here whether Cain confuses his offering being rejected, with the thought that maybe the Lord rejected him. "Nobody loves me" syndrome. And now that his actions catch up with him we find he is no longer able to be near the Lord or any of his original family. Cain is a very tragic and pitiful character. "with his wife and many of his brethren": Cain did not roam the world alone as some suggest. Rather, just like Satan, he took a host with him. Notice again the theme of division. In the end it is clear, Cain consistently did not do well, did not follow commandments, did not take advice well, did not repent, and eventually got too close to sin - ultimately murdering his brother. "Spirit of God...abode upon him": this is our first indication that Enoch did well in his life. Notice the "abode" implies more than just a temporary or brief visit. What can we do to have the Spirit abide with us more permanently? "bowed himself": compare this humble man to the prideful and angry Cain. What is the first characteristic that marks a life done well? Humility. "but a lad", "people hate me", "slow of speech": Enoch asks a good question, why did you choose me - I'm inexperienced, unliked and I'm not a preacher?! Why does the Lord choose such people? Now compare Moses 6:31 with Moses 7:13 "so powerful was the word of Enoch and so great was the power of the language which God had given him". Wow! That is some fulfillment of a promise and quite a spectacular testimony of faith. "Choose ye this day": we should not procrastinate the day of our repentance. The Lord requires us to choose NOW. "wherefore all thy words will I justify": this is an incredible sign of trust. 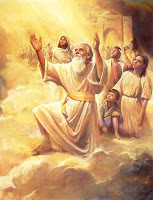 cf again Moses 7:13 (prophecy/blessing fulfilled) Can the Lord say that to us today? Is Enoch being ordained to some office here? "thou shalt abide in me and I in you; therefore walk with me": I find something very beautiful and personal and covenantal in this. Compare this with Ruth 1:16-17. Notice the contrast between Enoch and Cain. Enoch does what he is asked to do, is humble and finds himself in a real close, spiritually intimate relationship with the Lord. Cain on the other hand, does not do what he asks and instead of humbling himself gets angry and more disobedient and finds himself separated from God. "A see-er have the Lord raised up": I wonder if Enoch is the first to be invited to share in one of these epic visions of the entirety of the universe? I would appear to be a significant and marked event in the history of the children of Adam. "went forth...with a loud voice": Enoch did not try to run away from his calling. Enoch did not quietly try a few times. He essentially dove headfirst and wholeheartedly into his calling, trusting the Lord. This dedication and faith is another mark of those that "doest well". "Mahijah": make of it what you will but this name is not found in the bible. However his name is mentioned several times in the Dead Sea Scrolls in the same period, same role and same context as found in the Book of Moses (a book that Joseph Smith translated over 100 years before the Dead Sea Scrolls were discovered). "wherefore for this cause, to keep the commandments, I speak forth these words": what does this tell us about Enoch, his motivation and character in comparison to Cain's motivation v.31? "why counsel ye yourselves": do we waste time leaning on our own understanding rather than consulting God? "I have given unto you another law and commandment": As you watch Adam's progression starting at the Garden of Eden, you notice the Lord does not throw the whole plan at him straight away. Line upon line Adam learns a little bit more. First the three commandments in the garden (multiply, do not eat of the tree, remain with the woman), then outside the garden he is commanded to sacrifice, and then he is commanded to repent. I'm sure he received more instruction but it just seems so measured. Those that wish to progress learn that it is a gradual process. In this verse is the Lord discussing how Adam's children were born or how Adam himself was born? If Adam, then that is mind-boggling and cool! baptism - obedience, spirit - approved, blood - perfected: this is a great verse for understanding the stages of righteous man. If thou "doest well", you will keep commandments to show obedience, if you continue to do well approval/justification is shown by the constant presence of the Spirit, which in turn, if righteousness continues, leads to sanctification and perfection through the Atonement. "the record of heaven": in the final judgement how detrimental would it be to have no character witness? When we are not righteous we deprive ourselves of our own key character witness. The more worthy we live of the Spirit, the more witness and testimony can be given of our mortal probation. "behold mine abode forever": Enoch and his people do so well that they reach a stage where they are accepted and taken into heaven. Compare this to Cain who is forever removed from the Lord's presence. Both were brought up well and taught well, but still - one doest well and one doest not well. It is all about choice. "The choices we make, determine our destiny." Thomas S Monson. "behold these thy brethren; they are the workmanship of mine own hands,...I gave unto them their knowledge, I said...that they should love one another and that they should choose me, their Father; but they are without affection,...and misery shall be their doom;...they shall be in torment;"
Enoch is learning that God is not just about justice and truth and peace (v.31) but also love. The great Creator, this Supreme Being, Our God is pining for his wayward children that he loves so dearly, but that through their choice are suffering and in pain. When Enoch is shown all of this we get a sense maybe a glimmer of the emotion behind the words "and he wept" (v.28). In v41 Enoch experiences some of what the Lord feels for his children and "he wept and stretched forth his arms, and his heart swelled wide as eternity; and his bowels yearned; and all eternity shook." Is there a greater description of such emotions in all of scripture? What a beautiful, heartbreaking, gut-wrenching description of how our father feels about us when we suffer. He hates to see us suffer, even temporarily. Compare this to Satan's reaction to the same thing v.26 ("he looked up and laughed"). You can maybe therefore understand God's pleading simplicity when he sees a beloved child like Cain heading to the door, "If thou doest well, I will accept thee, and if thou doest not well, sin lieth at the door". In contrast, you can also understand the overwhelming joy he must feel when we do well. "ZION IS FLED": Enoch's city is taken up into heaven and away from the ever-increasing wickedness of the world. If my calculations and the generations listed in Genesis 5 are right, Noah was born a few years after this. Knowing what we know about the people in Noah's time, there is a real air of melancholy about that thought. Within another 600-700 yrs roughly the entire world has chosen to not do well. We shall study more about this next week but this must have been a real low point for Heavenly Father in the grand scheme and in his own deeply loving heart. Becky if you copy and paste that link into your browser it should take you right to the video. It is titled "The Lord's Side of the Line" and is a series of brief clips on the DeseretBook YouTube channel. Enjoy.